I absolutely loved “bubba ho tep” and I thought that the story line about a old Egyptian/redneck mummy going around a nursing home sucking the souls form the elderly’s assholes was genius . Throw in Bruce Campbell as elvis Presley , who accidentally ended up in the nursing home after his contract with a elvis impersonator went up in flames , and Ossie Davis as the black JFK ( government dyed him that colour) and you have a cult classic. 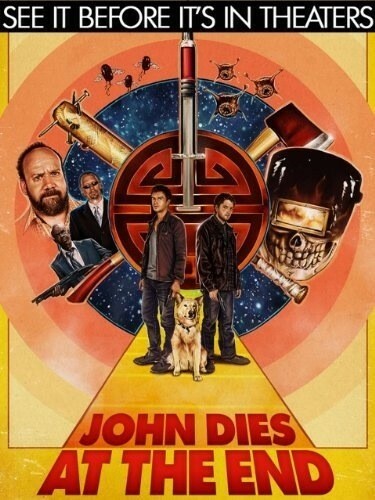 So “John dies at the end ” is the new film from the writer and director of “bubba ho tep” ( don coscerelli) and it’s one of the most imaginative films I’ve seen . This movie is bizarre and just like “bubba ho tep” it has a seriously fucked up story line about a new drug called “soy sauce”that fucks with different dimensions. The film actually starts off with the main charter beheading some dude in his garden with an axe ( with a nice blood on snow effect)and him as the narrator is saying ” this is me cutting off some guys head with an axe” and what follows is one of the most inventive films you’ll see ,If you liked “bubba ho tep” and you haven’t had the pleasure of seeing this . Then I advise you to get on it . Super excited for this to get to my local indie theater! Is this your favorite movie of 2013 so far? Most definitely one of them . I loved it for its whacky originality . I don’t think you’ll see a more creative film In years . Awesome! Well, I am looking up showtimes right now so I can check it out! I will respond to your email in the next couple of days I promise. I really like the indie film focus of your site! Good writing definitely! Will do! Look for an email on Thursday! Are you from the UK? Definitely going to check this out. Bubba ho tep was gas! Just like bubba ho tep dude , this is a creative film .